'Moment of Silence' Implemented At the border of Crown Heights and Brownsville, in an impoverished corner of Brooklyn, stands the hulking, tan brick building that houses P.S. 191, the Paul Robeson School. The school serves a student population that is remarkable in its disadvantage: 99% of its roughly 300 students in prekindergarten through fifth grade qualify for free or reduced-price lunches; some live at the homeless shelter next door. But every morning at 8:30, half an hour after rambunctious kids come bouncing into the building in their blue school uniforms, this school becomes remarkable in a different way. It gets quiet. For a full minute, there is only silence. After a teacher and a handful of students announce the moment of silence over the loudspeaker system and offer something to think about for that day — a personal goal, or how to help someone else — each and every person at P.S. 191, from the littlest 4-year-old prekindergartener to the principal, pauses for 60 seconds. P.S. 191 has been observing this morning ritual for the past three years, ever since Avraham Frank, a Hasidic Jew heeding the last Lubavitcher Rebbe’s call for a daily moment of silence in public schools, walked in off the street and introduced the idea to the principal. So far Frank, a white-bearded 59-year-old with a day job managing home attendants for New York City’s Human Resources Administration, has persuaded administrators at 13 public schools in Brooklyn, Manhattan and Queens to institute a moment of silence. Though school-sponsored prayer in American public schools has been prohibited since the 1962 U.S. Supreme Court decision in Engel v. Vitale, voluntary, student-initiated, private prayer is not. In response to the ban on school-sponsored prayer, there has been a nationwide push for the introduction into public schools of daily moments of silence that students can use to pray or reflect. New York State is one of about 30 states that has a law authorizing a daily moment of silence in schools, said Marc Stern, acting co-executive director of the American Jewish Congress and an expert in religion-state issues. In many places, however, moments of silence remain controversial. Federal courts have been divided on the constitutional issues surrounding moments of silence in public schools. A Texas law requiring the state’s schools to offer a moment of silence each day for students to “reflect, pray, meditate, or engage in any other silent activity that is not likely to interfere with or distract another student” was upheld in March 2009 by a panel of judges from the 5th U.S. Circuit Court of Appeals. The American Civil Liberties Union had objected to the Texas legislature’s addition of the word “pray” to the list of designated activities for the moment of silence, a word that had been omitted from the state’s previous moment-of-silence law. In January 2009 a federal judge ruled the opposite way and struck down as unconstitutional a similar statute in Illinois. Frank, for his part, frames his support for a moment of silence as a remedy to the prohibition on prayer in public schools. “This is for the good of the children, so that they grow up to be upstanding citizens of society. It encourages morality, and this is what we want to get in the schools, which is not there now since they cut out school prayer in the 1960s,” Frank said. “These children will bring the parents back to being moral upstanding citizens. Many of the students pray during this time,” he added. After a school has observed the moment of silence for a while, Frank asks school officials and students to write letters about their experience, which he then photocopies and shares with anyone who will read them. This was part of what the Lubavitcher Rebbe called for, starting in the early 1980s in his public talks, to “arouse public opinion” and urge legislators to institute moments of silence in public schools. A few years ago, Frank sent out 535 packets filled with letters of appreciation from students and principals, one to each member of the U.S. Senate and House of Representatives. He said he got only a single form letter in response. But Frank remains undeterred. “The Rebbe foresaw how to spread the idea, and the letters are the soul behind this whole movement,” he said. Frank, who lives in the Flatbush section of Brooklyn, is not an official Chabad-Lubavitch emissary, and his effort to introduce moments of silence in public schools has not received resources or official backing from Chabad representatives, though the movement’s emissaries in Illinois publicly backed the mandatory moment-of-silence law that was adopted there in 2007. 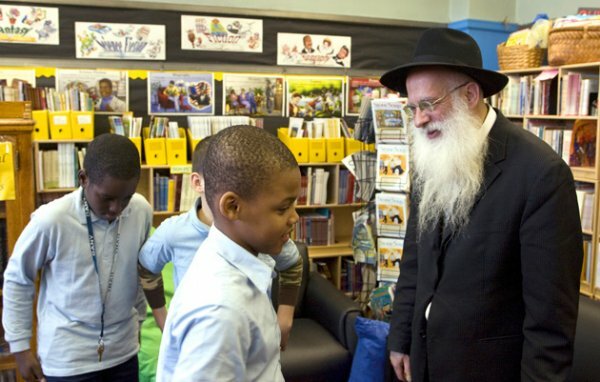 “When the Rebbe spoke about the importance of instituting a moment of silence in public schools, he was speaking to all people, not just Hasidim, and for the most part, the people who took on this initiative, with the inspiration from the Rebbe’s call to action, were not necessarily Lubavitchers,” said Rabbi Motti Seligson, a spokesman for the international Chabad movement. Whatever happens on a larger scale, staff members at P.S. 191 say they are happy to have a moment of silence in their school. Her 5-year-old granddaughter and 8-year-old son, both students at P.S. 191, love it so much that they insist on having a moment of silence even at home on the weekends, she said. And it has had a direct impact on the kids’ academic success, said Hadar Gafhi, the school’s assistant principal.